Hello Linux Geeksters. As you may know, Unsettings is a configuration tool for Unity that allows the users to change the Unity settings, like GTK themes, window manager, icons, cursors, switch off the global menu and the overlay scrollbars for the current user. Also, the users can export their settings in the JSON format and back them up, on a future installation or a new system. The latest version available is Unsettings 0.10, which has been recently released, coming with support for all the supported Ubuntu systems using Unity: Ubuntu 15.04, Ubuntu 14.10, Ubuntu 14.04 and Ubuntu 12.04. 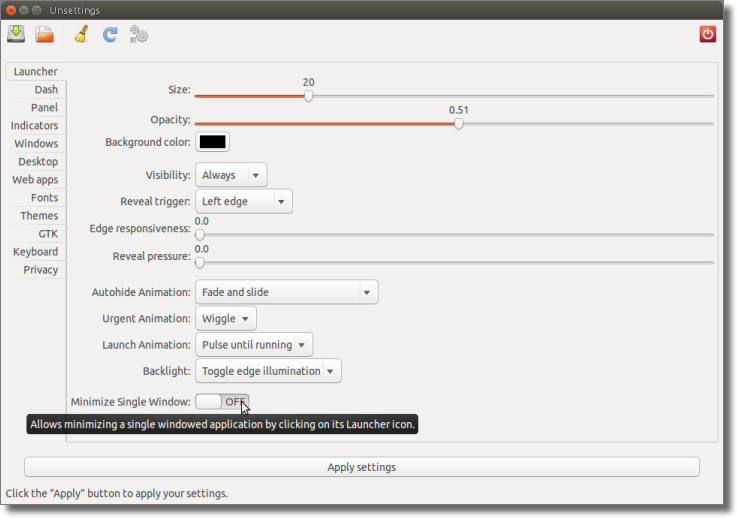 In this article I will show you how to install Unsettings 0.10 on Ubuntu 15.04 Vivid Vervet, Ubuntu 14.10 Utopic Unicorn, Ubuntu 14.04 Trusty Tahr, Ubuntu 12.04 Precise Pangolin using the Unity desktop environment.